I’ll have you know, I’m terribly allergic to lilacs. And yet I still stuck my face in the lilac bush the other day and took a whole bunch of photos. This is my favorite. In fact, I love it so much it has replaced Margene’s mountains as my new desktop background. Yesterday’s springy socks look so refreshing – like a fresh breath of spring air (without the pollen). Beautiful! 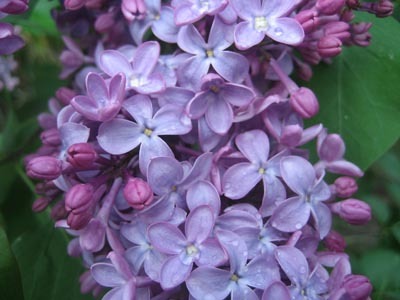 Lilacs are my favorite flower smell and yes, I’m allergic to them too. It’s so unfair. Risking sinus and nose to bring you beauty! And they are:) Love your Spring Fling socks, so pretty! At least pollen can’t seep thru the monotor!! Thanks for risking life and limb (er, sinus); to get the shot! BEAUTIFUL!! Have a Great weekend! Well, I never. Actually I might still your picture for my desktop background. Beautiful. You can even see the dew drops on the flowers. Hubby cut a bunch from the neighbor’s bush (she knows how much I love them) and put them all over the house for me. Thanks for making the sacrifice. The colors in that picture are worth it though because they are gorgeous. Wouldn’t those colors look great as socks? I wait them for them all year long. Those and the Lily of the Valley. Beautiful photo! Oh, I’m grateful for the lilac picture. They don’t grow in sub-tropical Louisiana because the winters aren’t cold enough. People point me to Ligustrum, a white flowering shrub/tree. Sorry, there’s no comparison. Worst of all, Ligustrum smells like someone tracked in dog —-! Anyway, I miss lilacs. They are SO lovely. I’m allergic to them, too. What a bummer to be allergic to lilacs. I keep them in the house as soon as they start blooming as their fragrance is my most favorite. I’m sure it was worth it. They smell sooooo good. *Sending digital antihistamine* As always, our stuff is just a little bit behind schedule. Our lilacs just haven’t quite popped yet so I’ll have to enjoy yours. If only you could send digital smell. Love the springy socks. The lilacs are so pretty-that is something I don’t see around here. oh you can almost smell their scent from that photo. Beautiful. Just more things that make me miss living up north so much ….Lilacs, hydrangeas and weeping willow trees!! I’m allergic to lilacs, too, but they sure are pretty! Have a great weekend. You’re allergic??? Oh no. Few things make me happier than a big bouquet of spring lilacs… especially the white ones. Beautiful! I’m the same way with lilacs. I love, love, love to see them in bloom. I have my favorite hedges of lilacs I drive by on the way to work and can’t wait until they’re in bloom. But I cannot be in a room with them! My lilacs are already gone but they are a big favorite so I must commend your bravery in the line of battle! YUMMMMMMMMMMMMMMMMMMM. Oh purple how do I love thee. Oh, Lilacs! I love them and the color. Just gorgeous. I love lilacs, too. Those are just beautiful. great photo – I can almost smell them right through my monitor… I luv the smell of lilacs. Sorry to hear that you are allergic. thanks for the beautiful sight. Lilacs and lily-of-the-valley are my favorite fragrant flowers. Sorry that you’re allergic to them. And have at the RI S&W this weekend. Hopefully it won’t be like NH last year. Beautiful! I seem to be just about a week behind you; my lilacs are getting ready to open up. I LOVE the smell of lilacs! I’m also very allergic to them and have to fight with a whole boundary of them. Our neighbors put them in on their property line just after we bought our house. If they had already been there we wouldn’t have bought this house as they are right outside our bedroom window. But they are indeed very pretty! How horrible that you’re allergic to such a beautiful and sweet smelling flower. Bummer! Thanks for the photo though.. it’s gorgeous! Have a wonderful weekend. That’s so unfortunate that you’re allergic to lilacs. Their scent is so wonderful. Your picture is beautiful – I love the different shades of purple. very allergic to lilacs here as well. as a matter of fact I am sneezing and sniffling and sinuses all clogged up from just looking at your lovely photo you so bravely took! those who are not allergic think its minor- but its not. If I could figure out how I would take the gorgeousest photos I’ve seen all over blogland and put them together in one of those slide-show screen savers. Those lilacs would definitely make the cut. They are among my favorites too. So sorry to hear that you are allergic to lilacs! I LOVE lilacs. Just love them. They don’t grow here, and I miss them terribly. So wonderful seeing yours. Bummer that you’re allergic to them! Very pretty! I’ve taken some very similar photos of lilacs, they’re so photogenic! I adore lilacs! Just beautiful…thanks for sharing! Mmm, I love the scent of lilacs. Sadly, I only have a teeny-tiny bush and the late frost took all the buds it had. Guess I’ll have to wait another year!